Things I liked: the look, feel, and weight. Things I would have changed: pretty much everything else, as follows: Sep 22, 16:12 EDT I recently purchased an H&K P30 which, after 535 rounds (divided as follows:) 200 rds. RWS Hobby/Sport Line 7.0 gr. pellet; 200 rds. 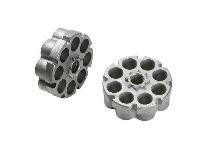 Crosman Premier Wadcutter 7.4 gr. ; 75 rds. Daisy Match Grade Precision Ground Shot; 60 rds. Copperhead Copper coated Premium bb's.) 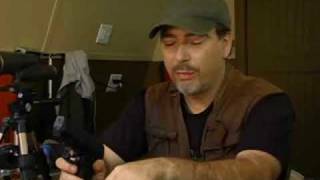 the H&K began to exhibit serious difficulties with bb's jamming in the magazine, causing the magazine to be extremely difficult to release from the mag-well forcing me to repeatedly clear the mag and reinsert it. Also, when switching from bb to pellet, (and yes, i locked and unlocked the mag between switches between bb and pellet ammo, and i was sure to insert and remove the BB spacer each time. I ran through 3/1-2 to 4 CO2 cartridges in the process (wasn't carefully tracking CO2 use). 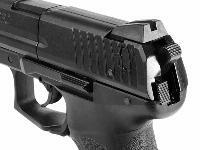 Now the pistol jams every single time, the mag is extremely difficult to release, and will not fire with any ammo, either bb or pellet. Also, the trigger pull was excessively heavy. What others should know: I can provide a cellphone number if necessary and would love to speak with you directly if is it helpful. My shipment arrived without a lock screw for the built-in sight. since I had ordered a laser sight along with it, it seemed like no big deal at first.. now that I have been disappointed by the overall performance related to the use of bb's or pellets in this gun, it seems like poor manufacturing and process controls and overall lack of quality in this particular instance. maybe I just got a Friday of a Monday gun, but it was a real disappointment overall. 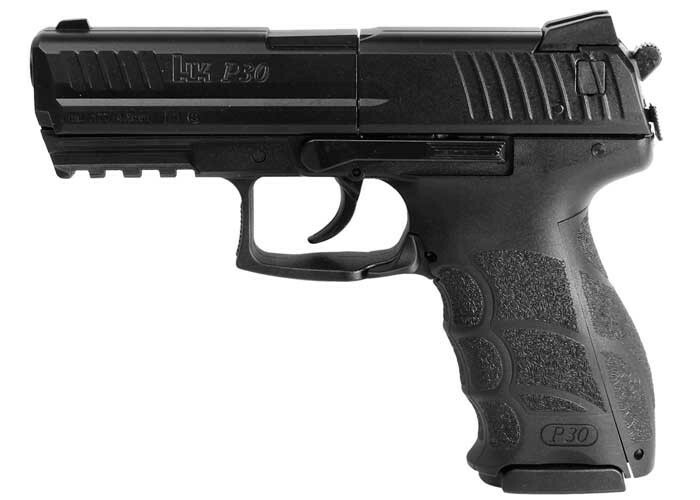 Things I liked: The H&K P30 is a well made pistol that feels good in your hand and exhibits good accuracy. The trigger is crisp and overall the pistol performs very well and consistent. Things I would have changed: I would not sell a quality pellet pistol for $210, with a rifled barrel, and tell customers that they can shoot steel BBs through the rifled barrel. Who would do this? I mean I have a Tanfoglio Gold BB pistol that exhibits a spread of 0.775 inches (3/4") at 8 yards (with pistol rest). The Tanfoglio Gold sells for $80. A BB pistol, with a smooth barrel, is a BB pistol. And a pellet pistol, with a rifled barrel, is a pellet pistol. I have a Walther CP99. I really like the versatility and the possibility of having multiple CO2 cartridge magazines. 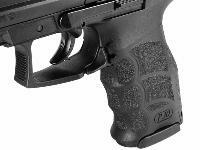 I have not found any additional CO2 cartridge magazines being offered for the H&K P 30. What Umarex should have done was to ditch the combination BB and CO2 magazine for the same CO2 magazine that is used in the CP99. Update to the review above. 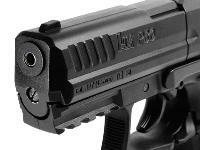 Like the CP99 you can get 10 pellet clips (80 shots) with the P30 on one CO2 cartridge. However, the last 2 pellet clips shoot noticeably low while still maintaining a consistent spread.This drop is not as noticeable in the CP99. Things I liked: As close as one can get to the real firearm P30. Heft, feel and quality is right there. An excellent training aid and a must have for replica collectors. 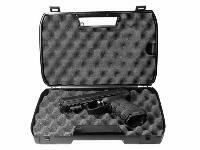 The fact that the air pistol comes in a padded hard case is a real bonus. Things I would have changed: Some form of tri-dot or colored sights would be nice. I would do away with the dual ability to shoot BBs or pellets. I prefer pellets as a rule. What others should know: For general plinking BBs are fine but if one ever wants to be serious about accuracy stick with the pellets. My recently purchased P30 will no longer receive the magazine. it refuses to latch into place despite changing from steel BB to pellet. I have checked the mag to ensure that it is in the proper mode for the ammo, but the magazine still refuses to seat itself. please help. 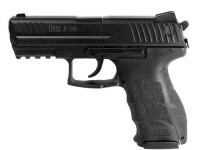 I have a ($500ish) H&K P30SK 9mm pistol, as well as a BB Gun HK USP, and 3 other BB Pistols which were all under $80...And all great... Why does this P30 BB Pistol cost 5 TIMES AS MUCH?? $250 MSRP?? 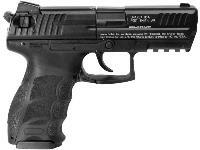 (USP is $50) what makes this BB gun so special, and worth that kind of money? This pistol is one of Umarex's top of the line "made in Germany" air pistols, like the Colt 1911a1, IWI desert eagle, Beretta 92fs and Walther cp99. The internal parts and overall build quality is a step up from the sub $100 replica air pistols that we all love. Can extra bb mags be purchased. This is Pellet version. The magazine can be purchased in addition.